On the left of the Map View are several tabs that allow you to customise the map. You can display the left panel by clicking on any tab in the panel. Once it is opened, you can resize the panel width. Hide the side panel by clicking the same tab. Alternatively, you can click the arrow icon above the tabs to display/hide the left panel. Expand the left panel in the Map View and open the Annotation tab. Title — Type a title for the map and adjust the font size for the title. The title will be displayed at the top center of the Map View. North Arrow — Select this check box to display the north arrow on the map and click on the drop-down box at Position to select the position of the north arrow on the map. Scale Bar — Select this check box to display the scale bar on the map and adjust the font size for the scale bar labels. Click on the drop-down box at Position to select the position of the scale bar on the map. Colour Bars — Select the Horizon check box to display a colour bar that represents the horizon on the map and select the position of the horizon colour bar. Similarly, select the Volume check box to display a colour bar that represents the volume shown on the map and select the position of the volume colour bar. Latitude/Longitude — This section is only available if you have specified a latitude/longitude datum during the configuration of the project coordinate reference system (CRS) (see Creating a Project). 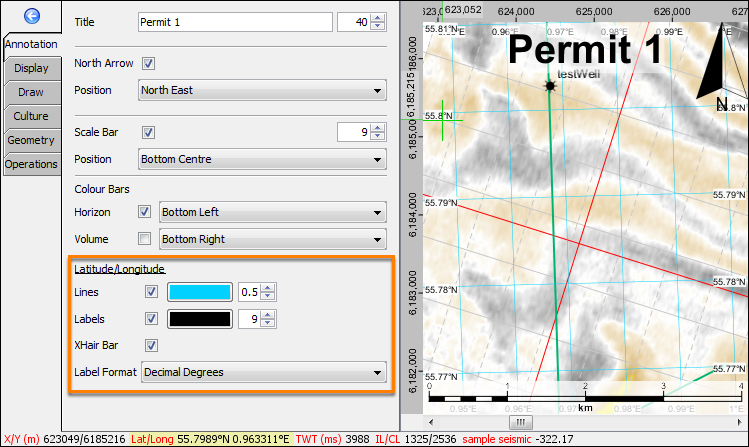 Lines — Select this check box to display the latitude/longitude grids on the map. Select the colour and type the line thickness for the grids. Labels — Select this check box to display the latitude/longitude labels on the map. Select the text colour and type the font size for the labels. XHair Bar — Select this check box to display the latitude/longitude locations in the information bar at the bottom of the map as you move the mouse pointer (green crosshair). In addition to the information bar in the Map View, the latitude/longitude locations under the mouse pointer will always be displayed in the XHair window if you have specified a latitude/longitude datum for the project CRS. Label Format — Select the format to be used for the latitude/longitude labels on the map. Available options include Decimal Degrees and Degrees/Minutes/Seconds. Expand the left panel in the Map View and open the Display tab (see Constraining the map area to limit the size of the map for this session). At the General section, change the Background colour of the Map View by clicking on the colourbar and selecting another colour. By default, the background colour will be set as white. 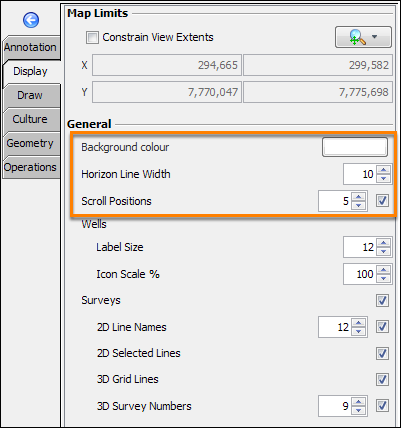 At Horizon Line Width, adjust the width of both 2D and 3D horizons that are displayed in the Map View. Select the Scroll Positions check box to highlight the zoom/scroll area on a line that is being displayed on section views (i.e. IL/CL View, Arbline View and 2D Views). You can also adjust the display on other views by dragging the highlighted area in the Map View. 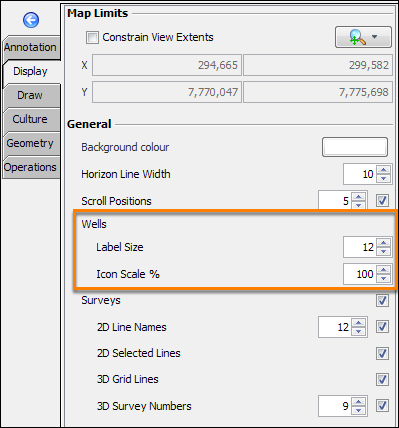 Label Size — Type the font size of the well names that are displayed in the Map View. Icon Scale % — Type the size of the well icons that are displayed in the Map View. The range is between 0%–300%. Select the Surveys check box to display all the survey grids on the map. If you clear this check box, the 2D Line Names, 2D Selected Lines, 3D Grid Lines and 3D Survey Numbers fields will be disabled. 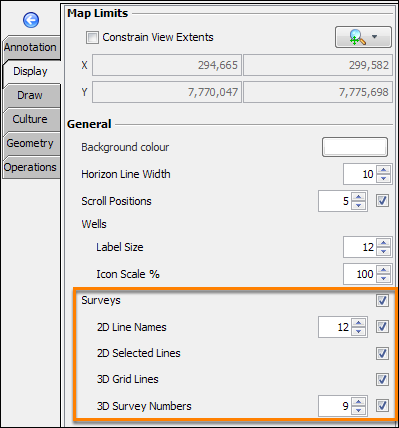 Select the 2D Line Names check box to to display the 2D line names on the map if you have a 2D survey. Select the 2D Selected Lines check box to display the selected 2D lines (blue lines) on the map. Select the 3D Grid Lines check box to display the IL and CL grids on the map. 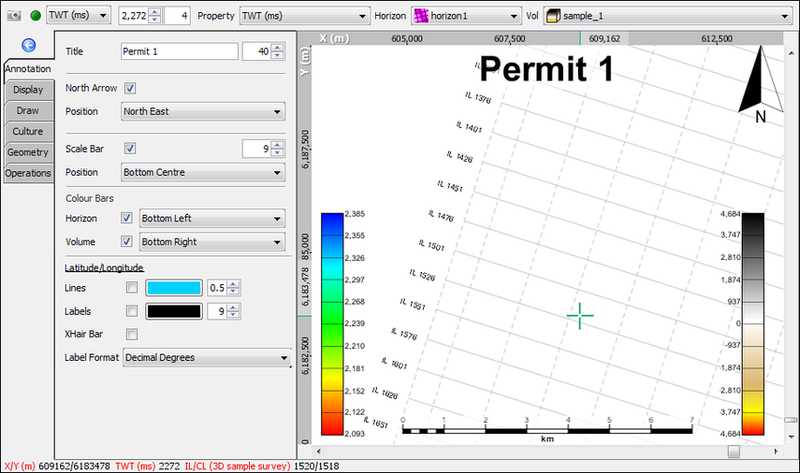 Select the 3D Survey Numbers check box to display the IL and CL labels at the 3D survey grids on the map. Tip: The visibility of the Map View’s survey lines and annotations is primarily controlled by enabling or disabling the survey in the Survey tab. If you have activated a survey but want to hide the display of the survey lines in the map, open the Display tab in the Map View. Go to the General section and clear the Surveys check box. At Fault Intersection, select which fault intersection to show in the Map View: Horizontal Slice, Horizon or Both. This will display the points at which the faults intersect with either the horizontal slice, horizon or both. Select None if you do not wish to display any fault intersections. Note: This option also determines which surface you are picking your fault on. If you try to fault pick when Both is selected, an error message will appear to tell you that it is not allowed. To display contours in the Map View, see Displaying Contours.